4 different stargazers - note the eyes and the blue and orange semi-circular "epaulette" marks on the "shoulders" in the bottom two specimens - these are not always present as the other two specimens show, but it is quite common. The eyes that caught the imagination of news sites everywhere: real eyes serving as fake eyes! In July 2002 Guido Zsilavecz photographed this species at Windmill, in False Bay. He saw the species occasionally subsequently to that, and in 2008 asked Professor Charles Griffiths of UCT as to what it was. At the time Prof. Griffiths wasn't sure as to what it was, and suggested collecting some in order to key it out, to determine the species. As the species is rarely seen, none were collected at the time. By 2011 more species had been seen, and Guido showed images to fellow SURG-member Georgina Jones, who showed it again to Professor Griffiths in 2013. This increased interest was partially triggered by UCT student Jessica Dawson having taken a photograph on one, and showing it to Georgina Jones. By that stage Guido Zsilavecz had managed to catch some, and in March 2013, when Prof. Griffiths approached Guido for samples, he could oblige. As the species were unknown to Prof. Griffiths he contacted Prof. Karl Wittmann for further assistance. Initially it was throught that the species was Mysidopsis eremita, a barely-known species, but upon further investigation it was determined that it was a new species. 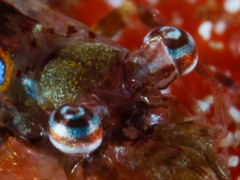 The most curious aspect of this species are the eyes - those concentric bands which give the appearance of staring into space, but also, if looked at directly from the top, give the appearance of eyes with a large pupil. The eyes are compound eyes, as usual, and the bands are pure colour. The belief is that by appearing like more "normal" eyes, predators may think this is a larger animal, and hence scare them off, as is the case with fake eyespots on fish and insects - except that in this case the fake eyespots are the eyes! Due to involvement with Prof. Griffiths and other new species (see Myzostoma fuscomaculatum and Hippolyte catagrapha, Prof. Griffiths decided to name it in Guido's honour. The paper was published in 2014, and it was handed over to Guido in mid-November 2014 during a session with UCT media present. The article UCT published caught the attention of the international media, and was reproduced widely, in languages from Dutch to Spanish, Russian, Arabic, Chinese and other Asian languages. China Central TV (CCTV) also ran a short clip showing both Guido and Prof. Griffiths. Below is the full article as it appeared on the UCT news site. The link to the paper is given in the references. 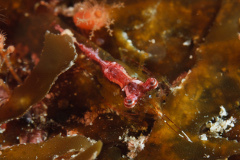 A tiny shrimp with banded, stalked eyes, and gaudy red 'warning' colouring, is the latest of several new marine species to be found by UCT researchers in the extensively sampled waters of False Bay. 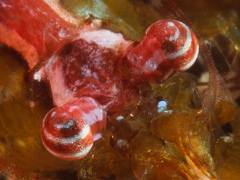 The small crustacean, a mere 10 to 15mm long, goes by the charming name of stargazer mysid, so called by divers who first saw it, because its eyes seem to gaze permanently upwards. 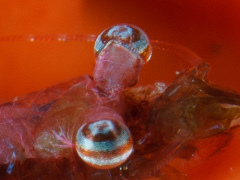 But don't be fooled, those apparently large, upward-staring eyes are just a trick of nature, as the eyes of shrimps don't have a pupil or iris. Instead, they're compound eyes like those of insects and consist of many simple elements that each look in a different direction. The vivid ringed patterns are thought to be there to make the eyes appear to belong to a much bigger creature, and hence to scare off predators. 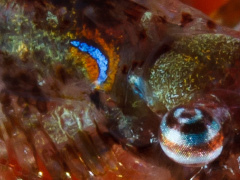 Though previously unknown to marine biologists, the pretty shrimp is a common sight among divers, says UCT alumnus Guido Zsilavecz, an avid underwater photographer who brought it to university marine biologist Emeritus Professor Charles Griffiths for identification. 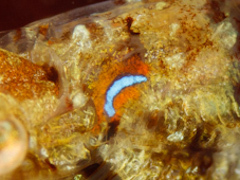 Griffiths was unable to identify the species and surprised by the shrimp's bawdy colouring and "fake eyes". "They act like the eye spots on moths' wings," he explained. 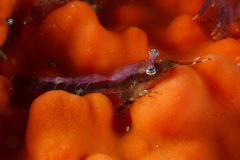 Griffiths sent the samples to international shrimp expert Professor Karl Wittmann off the University of Vienna in Austria, who confirmed it as being a new species and named it Mysidopsis zsilaveczi, after the diver who collected it. The species is described in a research paper co-authored by Griffiths and Wittmann and published in the journal Crustaceana, and is the ninth Mysidopsis species to be found in Southern African. The find is the latest 'catch' in an ongoing partnership between UCT and citizen scientists like Zsilavecz, who augment the university's scientific knowledge in botany and zoology. "We're a bridge between the public and science," said Zsilavecz. The computer scientist and co-founder of the Southern Underwater Research Group (SURG) learnt to dive as a UCT student and has been exploring the Cape's waters since 1989 (as well as many other exotic locales in both the Northern and Southern Hemispheres). Fascinated by the sub-marine world, and wanting to share the visual largesse, he bought a Nikonos V underwater camera to capture it all in pictures. He soon began contributing to marine guidebooks and identifying new species, like his favourite discovery, the recently described blue-spotted klipvis (Pavoclinus caeruleopunctatus). Having something named after him gives him a shot at immortality, Zsilavecz quipped during a presentation in the Department of Biological Sciences last week, a celebration of Griffiths and Wittmann's just-published paper on his discovery. "This confirms that the coastal waters of this subcontinent are one of the biodiversity hotspots in this genus," said Griffiths. But there's a twist in this tale. When Wittmann found he was dealing with a new species, but only had males among the first few samples sent to him, he asked Griffiths and Zsilavecz to collect and send him female samples of the stargazer mysid. They collected eight more specimens from the same reef, which they thought looked different to the males. "I thought at least one of them must be a female," Griffiths said. 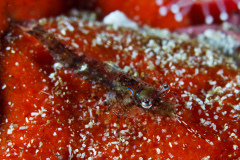 But each of the first two vials Wittmann opened revealed something else, not females, but two more completely new shrimp species – and there may be more in the unopened vials! "These can form the topic of another paper next year, but we wanted to get the description of this first species published in the interim," said Griffiths. "It's amazing that we're still finding so many new species in heavily dived waters like False Bay, right on our doorstep." 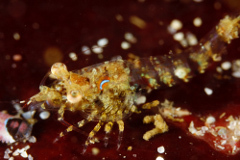 "Some 30 new marine species are found in South African waters annually," added Griffiths.